A few hours ago when most of us were in bed Mercedes GP Petronas took the sheet off their 2011 car dubbed the MGP W02 at the Valencia Circuit in Spain. Both Michael Schumacher and Nico Rosberg were on hand for the debut to pose for pictures and then jump in their new cars to get some testing under their belts. So did Mercedes GP build the new car around King Schumacher? I guess we will find out once we see some results from their first test. 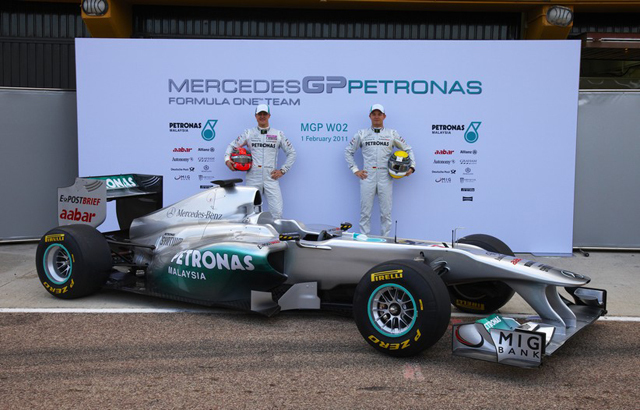 The debut of the MGP W02, the new Silver Arrow for the 2011 Formula One World Championship, took place this morning at the Valencia Circuit in Spain with the new challenger unveiled in front of the MERCEDES GP PETRONAS team garage by Nico Rosberg and Michael Schumacher. The result of twelve months intense design and development work, the MGP W02 is the second Silver Arrows car to be launched by MERCEDES GP PETRONAS since the team became the first Mercedes-Benz works outfit since 1955. The car’s livery is an evolution from its predecessor with a striking high-gloss airbrush effect highlighting the shape of the car. The interaction between the Silver Arrows heritage and the green shading representing the team’s title partner PETRONAS evokes memories of the first Silver Arrow car of 1934 with a modern touch added by 3D partner logos. The technical specification of the MGP W02 includes the KERS (Kinetic Energy Recovery) system which returns to the sport after a one-year absence. The Mercedes KERS system was the first to win a Grand Prix during the 2009 season when KERS made its debut in Formula One. Also new on the car for this season is the adjustable rear wing, operated by the driver to aid overtaking, and Pirelli tyres as the Italian manufacturer becomes the sport’s official tyre supplier. The team’s driver line-up remains unchanged with seven-time World Champion Michael Schumacher and Nico Rosberg, who achieved the team’s three podiums in 2010, forming one of the most exciting and talented pairings on the grid. “It is always a thrill to see a new car ready to take the track for the first time and this year is no exception. After our first year as the Mercedes-Benz works team, we are now seeing the benefits of our chassis group and our engine group working well together. With a good technical structure and a strengthened race engineering organisation, both at the factory and the race track, I am confident that we have done and will continue to do a better job this year in all key areas. “The new Silver Arrow for the 2011 season has little in common with its immediate predecessor. Our chassis engineers have taken a fairly ruthless approach and were determined to shave off every superfluous gram and millimetre. What emerged from this process is a compact and exquisitely shaped vehicle that introduces a host of sophisticated solutions and truly reflects the enormous dedication of its constructors. We have given it a brand new coat of paint, and we aim to see a smile on the faces of our hard-working drivers and team members that is as bright as our new silver livery. “Nico Rosberg and Michael Schumacher are top drivers who can win races for us, provided we build them the right car. At the same time, our team, like all the other teams, has to deal with complex new tasks. The new generation of tyres from Pirelli, and the extent to which the cars and drivers adapt to them, will play a vital role in deciding wins and defeats. “The rear wing flap, which can be adjusted under specified conditions, will boost top speed and facilitate overtaking which should open up a new and interesting chapter for Formula One. And there is the return of KERS following a one-year absence at the end of the 2009 season when our Mercedes system recorded a historic first race win. This will play a massive role amongst all of the performance-related components, both for the additional power and for the strategic options it makes available. As in 2009, it is our ambition that Mercedes-Benz builds and runs the best hybrid system and that all three teams which use it benefit significantly from this.